Size of this preview: 441 × 600 pixels. Other resolutions: 176 × 240 pixels | 353 × 480 pixels | 882 × 1,200 pixels. Unknown photographer. The architect of the pavilion was Ferdinand Boberg (1860–1946). 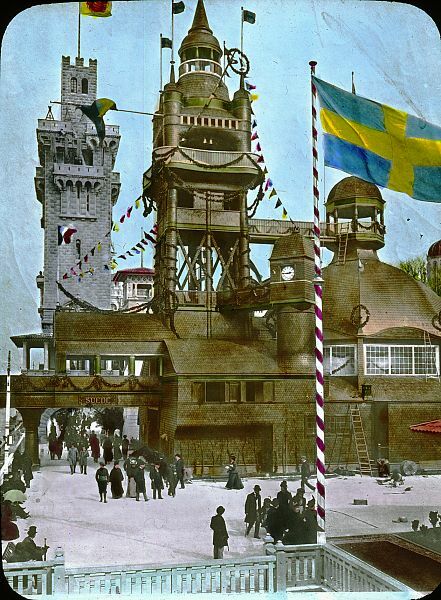 English: Original description: Paris Exposition: Swedish Pavilion, Paris, France, 1900. The Pavilion of Sweden located on the western portion of the Quai des Nations. (Hand-)colored lantern slide, original size 3.25×4 in. Français : Paris Exposition: Pavillon de la Suède, Paris, France, 1900. Le Pavillon de la Suède situé dans la partie ouest du Quai des Nations. (...) - Information complémentaire: la tour au fond appartient au Pavillon de Monaco. The Brooklyn Museum also holds the original glass negative of this image in their collections. We therefore assume that the photographer of this image was American, and that thus the museum's statement "no known copyright restrictions" indicates that this image is in the public domain. This image, originally posted to Flickr, was reviewed on 07:49, 24 March 2009 (UTC) by the administrator or reviewer Lupo, who confirmed that it was available on Flickr under the stated license on that date.